The senior choir is led by director Sylvia Eggleston. 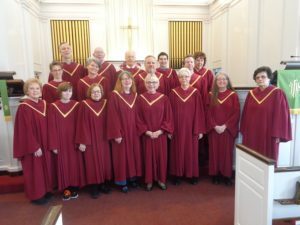 From September through early June, they fill our church with beautiful music, ranging from traditional to more contemporary songs. Members and guests alike are often wowed by their performances! They sing every Sunday at 10:30am except the last Sunday of the month. The senior choir rehearses Thursdays at 7pm. They are accompanied by organist Ed Scibilia, but often have other instrumentalists, such as a flutist, clarinetist, violinist, or guest pianist accompany them. They even have a youth dance interpretation complement their performance occasionally! The senior choir is made up of volunteers of all ages with a wide range of experience and is always looking for new voices to join!